AFP Interactive Hyper Fetch is no longer available. Please visit this page for suitable alternatives. The Interactive Hyper Fetch by All For Paws is an automatic ball launcher for small to medium sized dogs that provides hours of entertainment. Your dog can drop the ball at the top of the Hyper Fetch and it will be launched 10 seconds later. You can adjust the launching distance from 3 to 6 and 9 meters. The AFP Interactive Hyper Fetch comes with a remote control for the possibility of playing together. Do not leave your dog alone with the ball launcher. The ball launcher can be charged for both indoor and outdoor use. 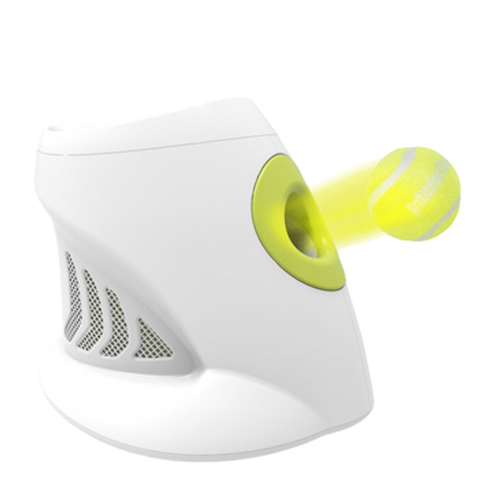 AFP Interactive Hyper Fetch Super Bounce Tennis Balls can be ordered separately. They come in packs of six and can also be used in the AFP Interactive Fetch'N Treat. You can use the AFP Interactive Fetch'N Treat to teach your dog to play with the AFP Interactive Hyper Fetch by themselves. Teaching your dog to use the launcher alone, allows you to get the most out of the product! The AFP Interactive Hyper Fetch comes with three tennis balls, the diameter of which is Ø - 5 cm. Have you used AFP Interactive Hyper Fetch before? Let us know what you think about this product.